Stop Traffick Fashion’s New Line, Logo and Website! My friend Emily Hill, the local lady who runs Stop Traffick Fashion, just emailed me about her brand new website, logo and their newest collection! The collection is called the L’Espoire Collection and is as inspiring as the survivors who made the apparel, jewelry and bags. You can read more about the collection here. Stop Traffick Fashion is about bringing an end to modern day slavery and human trafficking. We actually just wrote about Stop Traffic Fashion here on Cincy Chic! Make sure you learn more about this newly revamped local company that’s all about fab, philanthropic fashions! 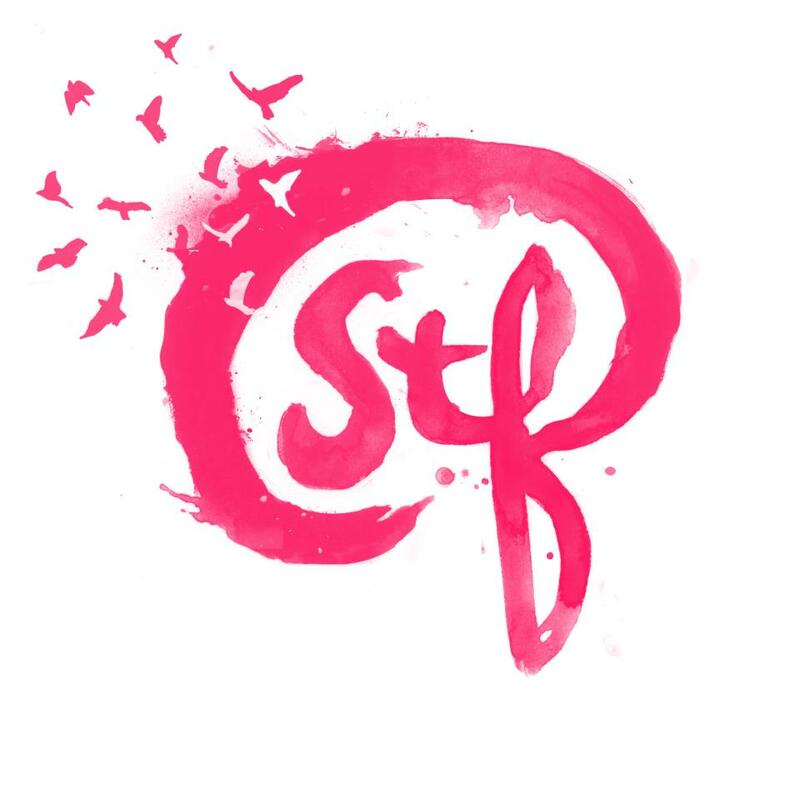 And you can see STF items in person at our upcoming Seasonably Chic Showcase on Nov. 3! Click here to learn more and RSVP! We recently held our Wearable Art Fashion Show and Lisa Robin Jewelry was the featured fashion show sponsor. Not only does Lisa Adkinson design beautiful baubles, but she also writes a fab blog! Click here to check it out — a few of her recent posts actually feature a few looks from our recent Wearable Art Fashion Show! Her pieces are designed with versatility in mind… see what I mean by reading this story (and watching the embedded webcast I did with her!) about Lisa Robin’s jewelry, the design concept and inspirations, and all the different ways you can wear her pieces! Eyebrow threading is becoming all the rage because of its great skin benefits! We’ve previously reported about how amazing threading is here on Cincy Chic. But the only problem with threading is that it’s tough to know where to get it done. Well, wonder no more. I just found out that Mitchell’s Salon and Day Spa will now be offering threading as a service! This is such great news! I love getting my eyebrows threaded! I have sensitive skin and waxing would always irritate and break out my skin. So, once I tried threading, I was absolutely hooked! And for those of you out there concerned about the effects of aging, I highly recommend you try threading – it helps maintain the elasticity around your eyes! Now you have no excuse to not get your thread on! Hat Fashion for Flying Pig Training! Ladies! If you’re getting ready for the Flying Pig or just trying to find something to keep your ears warm and the weather out of your eyes while you’re out for a run, Balconi hats are perfect for you! 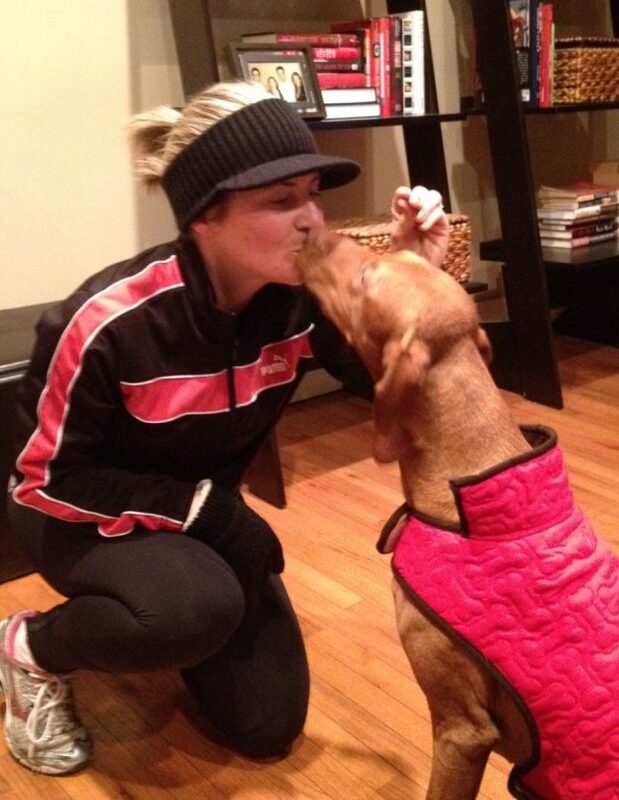 I posted the pic attached to this blog to my Facebook page because Dino was being super cute after our run. More people commented on my hat than anything else though. I have a few friends training for the Flying Pig and they wanted to know where to get one. So, I thought I’d blog about it to tell everyone! It’s actually perfect for Pig training (which I know from experience is always through the coldest, ickiest weather because the race is in Spring). Balconi hats are great because they’re made out of a thick, sweater-like material that keeps your head and ears warm. It also has a visor to keep the sun/snow out of your eyes. Then, it has an open top so you don’t have to smash your ponytail into the top of a hat! Even better, they were designed by local lady, Renee Balconi. Since I last spoke with her, she’s released a few more hat colors and a whole line of “wear your confidence” apparel. What a great message! Here’s an event you’re not going to want to miss! 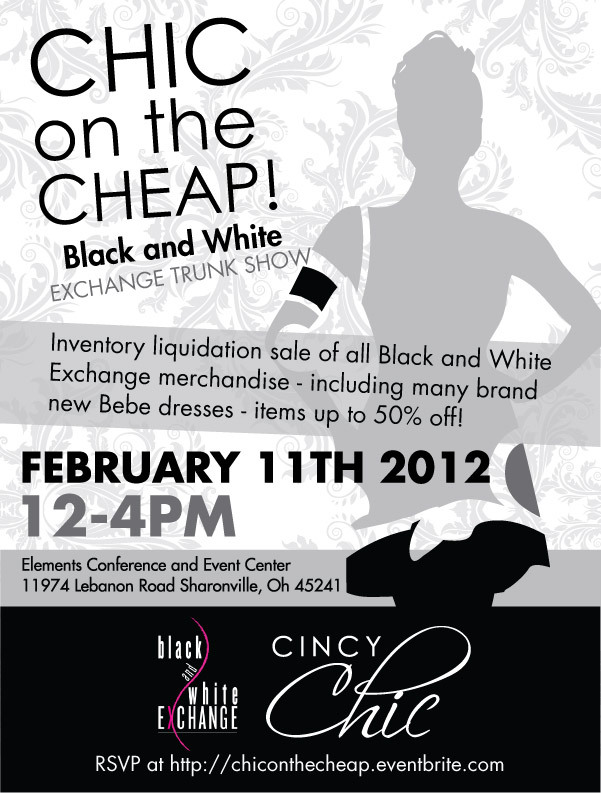 We helping to host a “Chic on the Cheap!” Trunk Show for Black and White Exchange. This will be an inventory liquidation sale of ALL Black and White Exchange merchandise- which includes many brand new Bebe dresses- as well as other items at up to 50% off! This is a deal you cannot miss out on! The event will be February 11 from 12-4pm at the Elements Conference and Event Center in Sharonville. Make sure you RSVP here and we will definitely see you there! Thanks to my intern Sara Elliott for helping me put this blog post together! 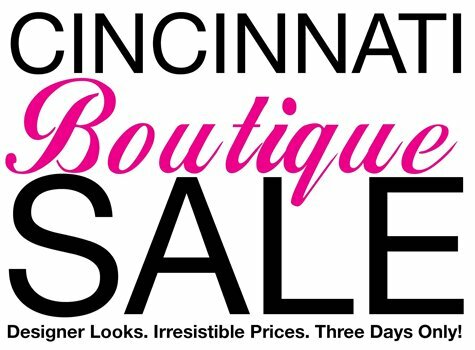 Just Announced: Cincinnati Boutique Sale Dates! Grab your calendars, ladies. I just found out the Cincinnati Boutique Sale‘s ever-so-secret sale dates! There is a $5 donation for admission to benefit The Karen Wellington Foundation for Breast Cancer – so your money will be going to a great cause! The location of the event is still under wraps but make sure you check out their website to keep yourself on the look-out for the release of this info! Here at Cincy Chic, we are always SO excited for this event! You’ll find the best deals of the year at this sale. Oh and a little piece of advice is to go on Friday for the best selection, and then go back on Sunday because the boutiques usually add more discounts on the last day to move the merchandise! Looking for something fun and exciting to do while getting some of that stressful Christmas shopping done? I’ve got the perfect idea! Monkee’s of Madeira is participating in Shop Madeira on December 3 from 10-6. Not only are you helping a local business, but Monkee’s is offering a free gift for ANY purchase! Like we’ve said on Cincy Chic, Monkee’s knows what’s trendy and are guaranteed to leave you and your wardrobe happy! Be sure to stop at Monkee’s and Madeira this weekend for some fabulous fashions and holiday fun! See you there! Thanks to my intern Sara Elliott for helping to put this blog post together!